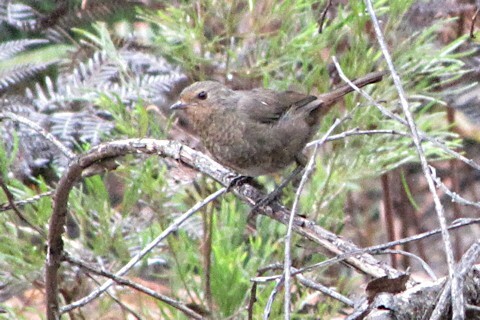 Standing in the forest in misting rain, I had my camera nursed inside my t-shirt to reduce the amount of moisture it was exposed to, when this little Pilotbird came hopping through the vegetation. I couldn't ignore a Pilotbird so I quickly extricated the camera and mounted it on the tripod. The light was poor and I knew I wouldn't get anything usable hand-holding the camera. Luckily, the bird waited for me and I managed to get this photograph of a species that has previously eluded my camera.